Rabbi Yaakov Glasser: "Recognizing Hashem's Hand In Our Lives"
Mrs. Rachel Besser: "Kiymu V’Kiblu"
Rabbi Dov Emerson: "Simchat Purim: Fake it ‘Till You Make it"
Rabbi Joseph Blumenthal: "A Significant Lesson from the Oddest of Sources"
Rabbi Daniel Grama: "Our Role in the Purim Miracle: Then and Now"
Mrs. Bracha Rutner: "Jewish Unity"
Rabbi Menachem Rosenbaum and Rabbi Yitzchak Sprung: "Memuchan is Haman: A Cautionary Tale"
Rabbi Noam Stein: "Purim Jokes and Shpiels"
Rabbi Eliyahu Alpert: "The Winning Ticket"
Rabbi Yehuda Balsam: "Accepting the Torah through Hidden Miracles"
Rabbi Donny Besser: "Amalek and the Stunning Power of Spiritual Genetics"
Rabbi Yehuda Chanales: "Menucha V'Simcha Ohr LaYehudim: Commemorating Shabbos & Amalek"
Rabbi Yitzchak Etshalom: "Mordekhai, Son of Yair"
Rabbi Nathaniel Helfgot: "Purim: From the Grassroots Up"
Rabbi Allan Houben: "Purim: It's More than Meets the Eye"
Rabbi Moshe Hubner: "Assemble the Jews: Assimilation is not an Option"
Mrs. Ora Lee Kanner: "Disconnection and Connection in Binyamin and Esther"
Rabbi Effie Kleinberg: "Those Who Bowed Down Were No Better Off"
Rabbi Aaron Levitt: "Uncovering Our Hidden Greatness"
Rabbi David Nachbar: "Turning the Ordinary into the Extraordinary: The Status of Yom Purim in Rambam's Mishneh Torah"
Rabbi Benjy Owen: "Shoshanat Ya'akov: Seeing Mordechai through Rose-Colored Glasses"
Ms. Sarah Robinson: "Kriyat Megillat Esther with Its Te'amim"
Rabbi Kenneth Schiowitz: "The Dawn of Jewish History"
Rabbi Moshe Schochet: "Purim: A Recommitment to Torah Sheba'al Peh"
Mrs. Atara Segal: "The Space Between Us: The Role of Place in the Purim Story"
Rabbi Sandy Shulkes: "The Hidden Meaning"
Rabbi Elon Soniker: "Purim: Finding Meaning and Passion in Our Mitzvos"
Rabbi Aryeh Stechler: "Video Conferencing the Megillah"
Rabbi Joshua Strulowitz: "How the Mitzvot of Purim Unmask Us"
Rabbi Meir Tannenbaum: "Living in a Walled City"
Rabbi Zacharia Weitz: "Loshon Hara You’ve Got to Hear"
Rabbi Yaakov Glasser: "The Menahel and the Manhig: Two Models of Leadership"
Rabbi Menachem Penner: "Open to Embracing Jews; Open to Embracing the Mesorah"
Rabbi Joshua Flug: "A Walking Sefer Torah"
Deena Rabinovich, EdD: "The Role of Vashti in the Purim Story"
Rabbi David Block: "Esther and Bas Paraoh: Reaching for What is Out of Reach"
Rabbi Tuvia Brander: "Our Hamantaschen's Forgotten Meaning"
Rabbi Michael Weingarten: "Self-Nullification through Inebriation"
Rabbi Dani Zuckerman: "Purim: The Simcha of Satiation"
Rabbi Eli Belizon: "Tick Tock the Purim Clock"
Rabbi Dr. David Horwitz: "Sefer and Iggeret: The Dual Nature of Megillat Esther"
Rabbi Jonathan Schachter: "What's in a name? A "LOT"!!!" Rabbi Robert Shur: "Selected Comments of the K'tav Sofer to Megillat Esther"
Ms. Eliana Sohn: "The Vilna Gaon's Purim Blessing"
Rabbi Michoel Zylberman: "The Converts of Shushan"
Rabbi Yosef Blau: "Mordechai and Esther: The Evolution of a Relationship"
Dr. Lisa Fredman: "Amalek and Yitro: What's the connection?" Rabbi Aharon Lichtenstein: "The Meaning of Ta'anit Esther"
Rabbi Menachem Penner: "The Origin of Mishloach Manot"
Rabbi Mark Smilowitz: "The Meaning of Mishlo'ach Manot"
Rabbi Eliezer Zwickler: "The Intrigue Behind Mordechai's Approval Rating"
Rabbi Hershel Schachter: "Semikhah: Then and Now"
Rabbi Dr. David Horwitz: "The Semikhah Controversy of the 1500's"
Rabbi Yosef Bronstein: "Rav Kook's Purim"
Rabbi Noah Cheses: "The King's Party and the Human Appetite for Control"
Rabbi Reuven Garrett: "Hope Amidst Despair"
Rabbi Chesky Gewirtz: "What It Means To Be a Jew"
Rabbi Yosef Sharbat: "Purim Masquerade: Unmasking the Origins"
Rabbi Jeremy Stern: "Taanit Esther: Giving Voice to Silenced Women"
Mrs. Nechama Price: "Secret Identities"
Rabbi Ian Shaffer: "Esther Hamalkah: The key to unlocking another layer of the Purim story"
Rabbi Dr. Moshe D. Tendler: "Genetics and Epigenetics in the Purim Miracle"
Rabbi Moshe Tzvi Weinberg: "Maintaining Peace of Mind in a High Speed World"
Rabbi Yosef Blau: "Remembering Purim During the Messianic Age"
Rabbi Joshua Flug: "The Relationship between Mishlo'ach Manot and Matanot La'Evyonim"
Rabbi Ozer Glickman: "Purim and the 'Randomness' of Life"
Dr. Shalom E. Holtz: "Whose Battle? Whose Victory?" 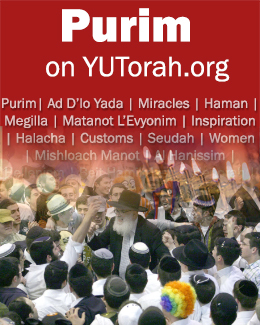 Mrs. Shoshana Schechter: "Purim – Fulfilling Jewish Destiny"
Rabbi Mordechai Torczyner: "The Joy of Giving"
Rabbi Yona Reiss: "Ad De'lo Yada: An Elucidation of the Notion of Intoxication on Purim"
Rabbi Mordechai Willig: "When is a Bar Mitzvah in a Leap Year?" Rabbi Simon Basalely: "Seudat Purim"
Rabbi Reuven Brand: "A Life of Giving"
Rabbi Jonathan Cohen: "The Halachah of History: Ancient Cities and the Date of Purim"
Rabbi Joshua Flug: "Why Don't We Recite Hallel on Purim?" Rabbi David Hellman: "The Meaning of Myrtles: Understanding Esther's Other Name"
Rabbi Aaron Kraft: "The Man-Made Holiday"
Rabbi Yoni Levin: "Making Scents of Purim"
Rabbi Moti Neuburger: "Purim: Out of Control"
Rabbi Etan Schnall: "A Tale of Two Cities? Shushan Purim in Modern-day Yerushalayim"
Rabbi Tzvi Sinensky: "Purim: The Other Day of Rest"
Rabbi Moshe Stavsky: "The Machatzit HaShekel and Selfless Giving"
Rabbi Yehuda Turetsky: "Hester Panim: Between Exile and Redemption"
Rabbi Norman Lamm: "Neither Here Nor There"
Rabbi Haskel Lookstein: "How Should Jews Party?" Rabbi Dovid Asher: "Am Mefuzar or Ish Echad?" Rabbi Michael Davies: "Shelo Asani Aved - Relationship with God, Relationship with Man"
Rabbi Aaron Feigenbaum: "The Hit You Can’t Forget: A Purim Torah about Tort Law"
Rabbi Eric Goldman: "Internalizing Ourselves"
Rabbi Raphy Hulkower: "What was Achashverosh Thinking?!" Rabbi Tzvi Sinensky: "One of these Mitzvot is not like the Others"
Rabbi Yigal Sklarin: "Mikrah Megillah: Vehicle for Prayer, a Medium for Praise, and a Form of Talmud Torah"